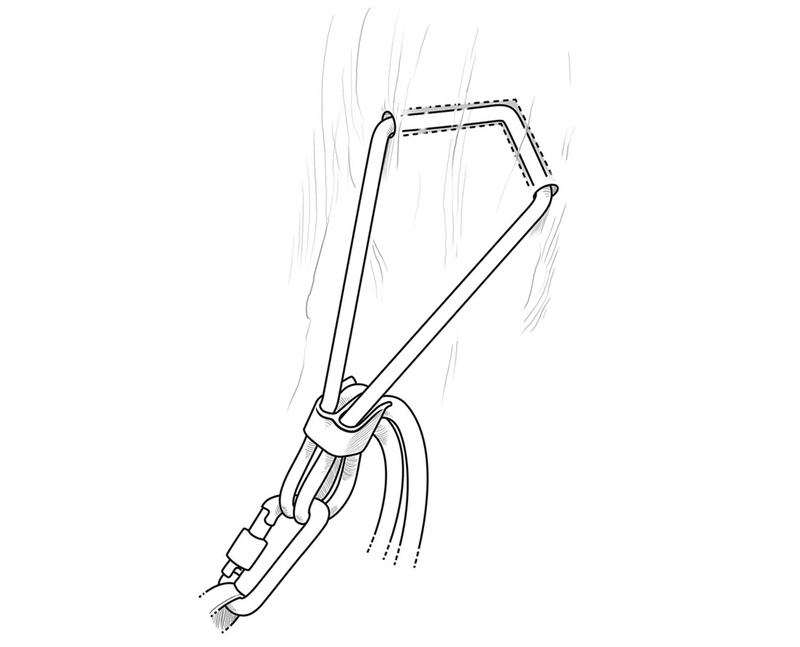 On remote climbs and ice and snow routes, we often have to make or beef up the rappel anchor. Here are a few tips for making a strong(er) rappel anchor without having to leave your entire rack behind. This article originally appeared in Rock and Ice issue 241 (April 2017). RAPPELLING IS A CHORE that we climbers don’t especially enjoy and think of as a necessary evil. 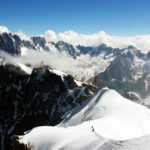 It’s also one of the more dangerous activities that can accompany a day of climbing—just check out the accident reports, and you will see that many attribute rappelling off the end of the rope as the cause. 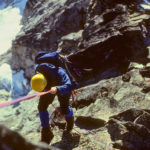 There is, of course, an easy way to avoid this recurring accident: Put knots in the ends of the ropes, and if you are worried about those knots getting stuck, clip them to your harness. Now that we have this common mistake taken care of, and that does take care of it, let’s talk about rappel anchors. Unfortunately, or fortunately, depending on your perspective, not every route has bolted stainless-steel rappel anchors. 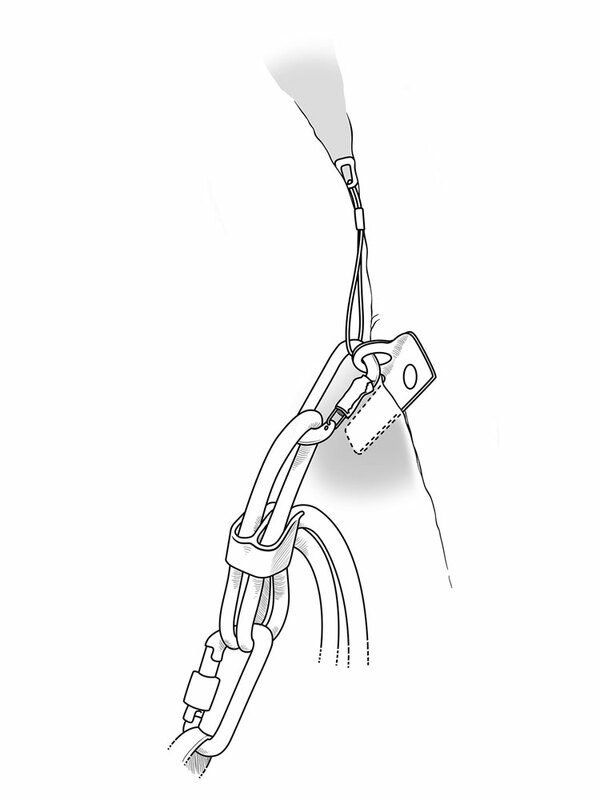 On remote climbs and ice and snow routes, for example, we often have to make or beef up the rappel anchor. 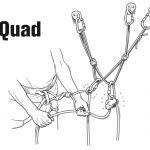 Here are a few tips for making a strong(er) rappel anchor without having to leave your entire rack behind. A naked or “O-thread” where the rope is threaded directly through the “V” lets you descend ice without leaving behind any gear. 1. 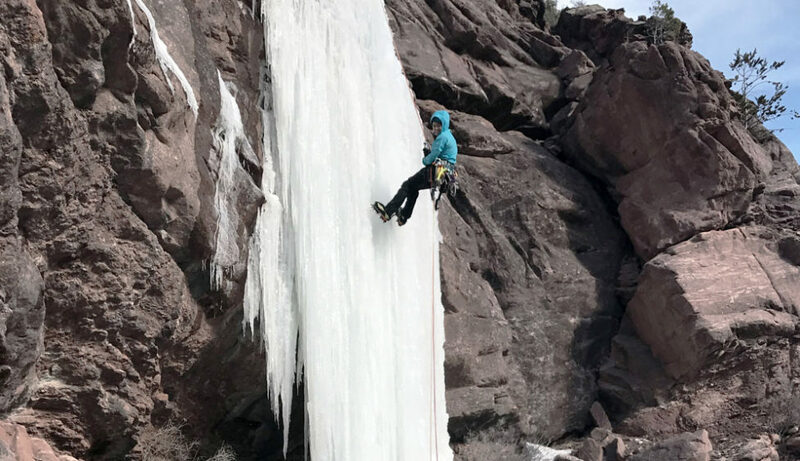 Ice is probably the easiest medium for creating a bomber rappel anchor: Find a thick piece of good ice, slap in a V-thread, and off you go. Simple. But what if your descent involves numerous rappels, and you don’t have enough cord to thread and leave a sling at every station? 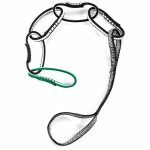 Then you can use the handy “naked” thread, where instead of threading your cord or a sling through the V-thread, you thread your climbing rope through the ice. This method allows you to have a strong anchor and leave nothing behind. To facilitate a naked or “O” thread, remove the tape or plastic end caps from your rope. This will help the rope end turn the corner inside the V-thread. You will also want a real V-thread tool, like the JSnare, Petzl Multihook or Black Diamond First Shot, and not a bent piece of coat hanger. An A-thread is a vertically oriented version of the V-thread and can let the rope pull more easily for retrieval. Note the ice-screw backup, to be removed by the last person to rappel. 2. There is also the A-thread. Many people have found that an A-thread pulls a lot better than a V-thread, and limited batch testing has shown that the A-thread could be slightly stronger. Either way, it’s nice to round off the back and bottom edges of the drilled holes before you rappel by sawing the rope back and forth in the thread. You should also back up the naked thread with an ice screw for the first person down, and the last person should remove the screw. Personally, I like having the person who drilled the thread go last without the backup. This gives the climber extra motivation to drill it deep. 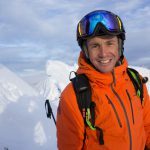 If you are in a popular area, it’s best to use a multi-point V-thread (or A-thread)—multiple threads in a series—with metal at the rappel point, but for remote climbs, when you are trying to save gear, the naked thread is the ticket. Just be careful on super-cold days in wet ice. 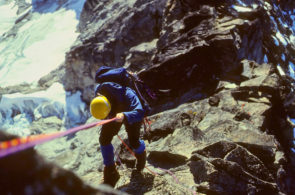 Naked threads in these conditions can freeze the rope in place, and a traditional V-thread or A-thread with cord or a sling may be better. 3-4. Why would you ever need to rappel on snow? Snow is easy. You should just down climb. Right? Well, sometimes snow isn’t that easy. 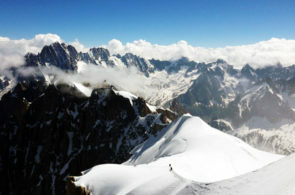 Think of a steep face in Peru, or a bergschrund at the bottom of a climb, or a cornice you need to rappel. The nice thing about snow is that it’s easy to work with. Making a snow anchor does take judgment since the strength of snow can vary considerably. When in doubt, go with more surface area by constructing a larger anchor. My favorite snow anchor is a buried rock with a piece of cord tied around it. Bury the rock as you would a deadman anchor (T-trench), and choose the size of the rock according to the density of the snow. Softer snow requires a larger rock. The rock doesn’t have to be heavy. It just needs to have sufficient surface area. In bomber snow, a toaster-sized rock might suffice. 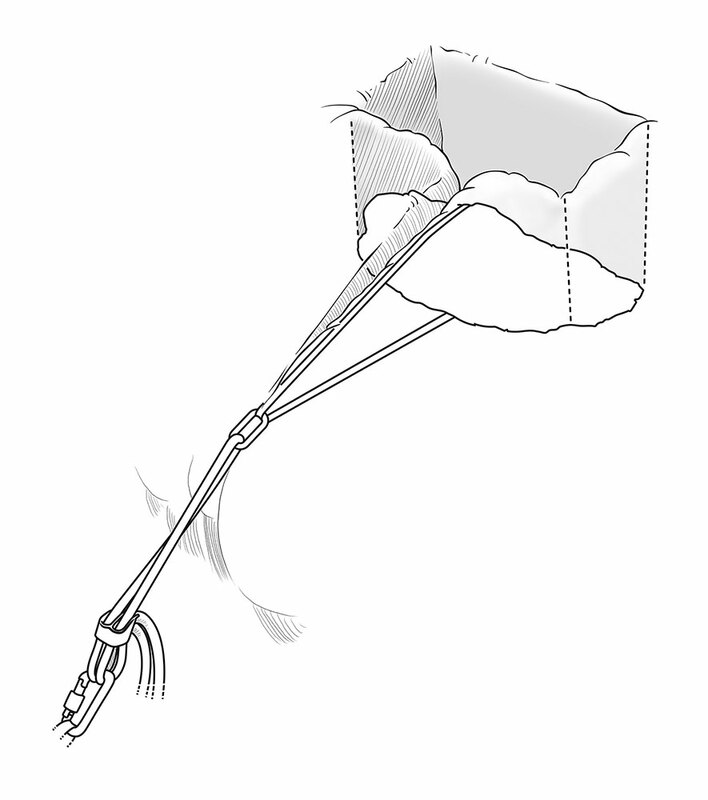 Another technique is to use a buried stuff sack filled with snow, with a sling or cord tied around it. 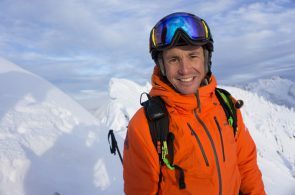 My crampon bag, which is often a stuff sack for a set of ski skins, works well, and I always have it with me in the snowy mountains. 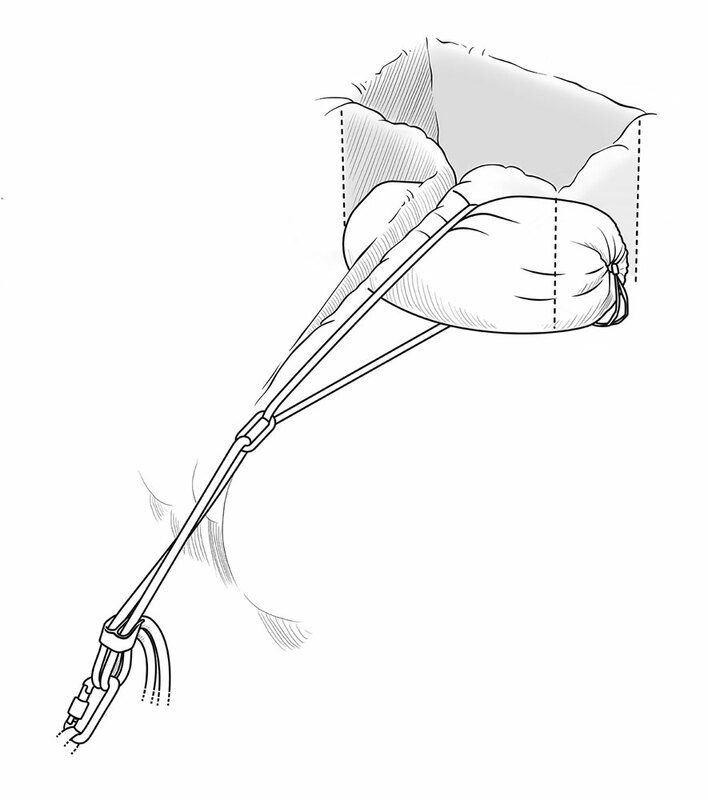 The key with the stuff-sack rappel is making sure you back-fill the T-trench and pack down the snow to keep the sack from bending and the seams from ripping. This technique works well in stiffer snow (one-finger density or harder), but you will need more surface area when working with softer snow. If no rocks are available, a buried stuff sack filled with snow can work as an anchor. Same as with a rock, back-fill and pack the snow around the anchor. A rock buried in dense snow can serve as a rappel anchor. Back-fill the trench and pack the snow around the anchor. A small selection of old nuts that you can hammer into cracks and a few thin pitons make a nice kit for building alpine rappel anchors. 5. Rock is where you will likely find the strongest anchors, but creating a solid anchor can take skill and creativity. I find that a few skinny pitons (Bugaboos and knifeblades), some old nuts (old because I’m more willing to leave them behind), and 6- or 7-mm cord are best for constructing rappel anchors in rock. Don’t be shy about hammering on your nuts to set them better. This can make the difference between an O.K. placement and a bomber one. Just don’t damage the wire in the process. I also like to have a few carabiners with tape wound around the spine. Once the anchor is rigged for the rappel, you can unwind some of the tape to “lock” the carabiner gates closed. Taped biners are more useful than quick links since you can also use them for climbing, and they are less likely to be stolen by the next team. 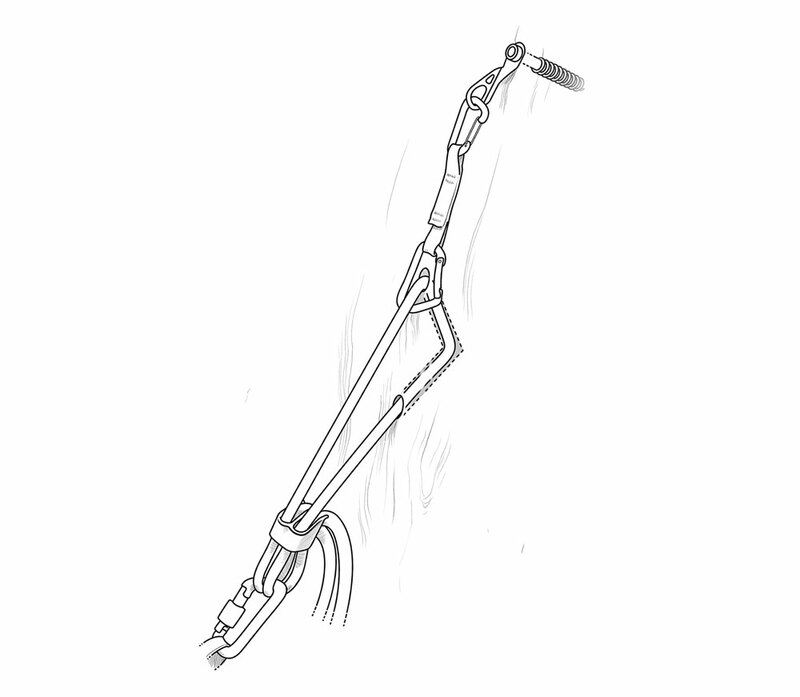 Having a metal point on the anchor prevents the ropes from sawing and damaging it, and makes the ropes easier to pull. The last and probably the most important thing I carry is a small knife. I’m amazed at how often the established rappel station is a complete mess of tattered, sun-bleached slings. Without a knife it’s hard to clean things up. If you are going to add another sling to the mess, the least you can do is remove some of the more weather-beaten material. You are not only cleaning up trash, but making it easier for the next person to inspect the integrity of the anchor and slings.